In the past few decades, the wages of most workers have stagnated, even as productivity increased. Social supports have been cut, while corporations have achieved record profits. What is going on? 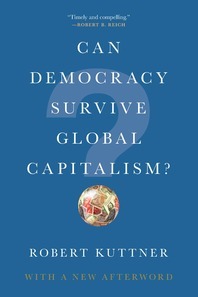 According to Robert Kuttner, global capitalism is to blame. By limiting workers’ rights, liberating bankers, and allowing corporations to evade taxation, raw capitalism strikes at the very foundation of a healthy democracy. Capitalism should serve democracy and not the other way around. One result of this misunderstanding is the large number of disillusioned voters who supported the faux populism of Donald Trump. Charting a plan for bold action based on political precedent, Can Democracy Survive Global Capitalism? is essential reading for anyone eager to reverse the decline of democracy in the West.